Happy Meal and I had finished up at the Aquarium of the Pacific, and it was time for dinner. We had been hearing good things about Simmzy's, and it was kind of..sort of...on the way to our domicile. Parking was relatively easy, but they juke an extra quarter/hour out of you in Manhattan Beach by only giving you 12 minutes for a quarter. Simmzy's had a healthy menu of microbrews, but Happy Meal was already tanked on the vodka that I used to spike his apple juice--he's so cute when he bumps into walls. I still had to drive that evening, and the fistful of random pills that I had kiestered earlier in the afternoon were starting to kick in. I didn't want to add another chemical element into the mix. We ordered Diet Coke and lemonade. After the usual awkward interrogation of the server to determine what cuts of beef were in the burgers--they always say "Angus" first...sigh. We ordered a couple of plain cheeseburgers cooked Medium. 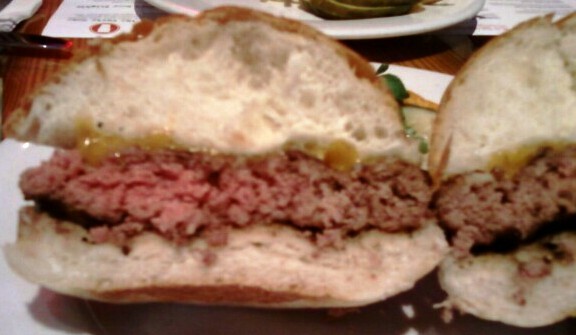 The Beef: It was Sterling Chuck derived from Angus cattle. The beef had no taste of aging or iron, and it was only mildly beefy in flavor. It was ground to medium. 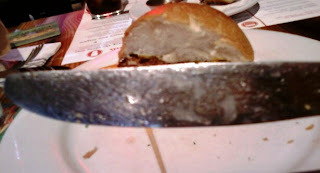 It was far greasier than it needed to be--see the shot of well-lubed knife later in this review to get a feel for the fat content of the burger at Simmzy's. Keep in mind that this was the same beef that Nook used for their burgers, but at Simmzy's the beef had almost no character. 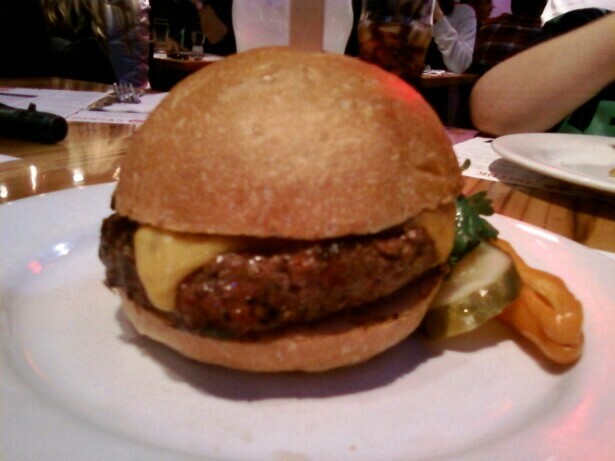 Nook's burger made a funky , bold statement. This burger was timid in comparison. This may have been due to the choice and application of the seasonings. 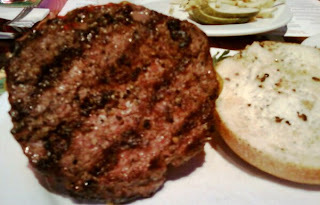 The Seasoning: This was my first burger au poivre. Simmzy's got a crunchy coating of mild, cracked peppercorns on the burger. 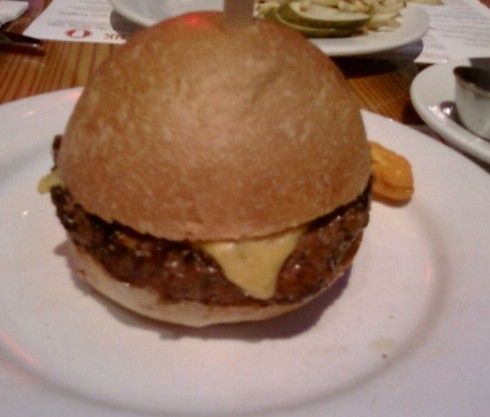 Next, they melted the cheese on top of that to inexorably fuse it to the burger. This was way too much cracked pepper for the thickish burger--it obscured all of the other flavors. This was true for both burgers. An au poivre treatment is great on a steak, but that's because the texture of the steak causes the effect of the pepper to dissipate during the chewing process...in the case of the Simmzy's burger, chewing simply forced the pepper evenly throughout the ground beef. The result was that pepper flavor dominated the bite from start to finish. The Sear: They used a wood fired grill to get a lackluster sear on the burger patties, but it provided no crunch. The Preparation: The coating of cracked pepper overwhelmed any smokiness that may have been present from grilling the burger over a wood fire. The burgers came out closer to Med Well than the requested Medium. The burger patty was formed with medium pressure, so it was firm but not chewy. The Cheese: This was a very mild Cheddar, which was properly melted. It really lacked oomph, and it ended up being a passive player in this dish. Considering the power of the seasoning on the burger, they should have used a much sharper cheese to fight through the coating of pepper and provide some umami and savoriness to the dish. The Bun: The bun was one of those impeccably toothsome, neutral, moist, and perfectly competent brioche-style buns from Breadbar. It was not toasted, and in the face of a weak sear, the bun really should have been toasted to provide that element of texture. The Meat to Bun Ratio: Perfect! It's almost impossible to go wrong with a bun from Breadbar. 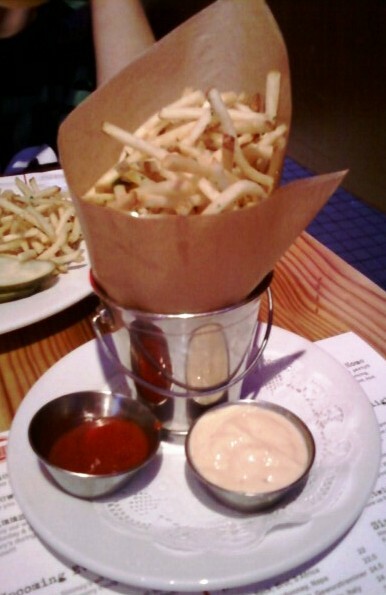 The Fries: They were very crisp, but they were over-salted with a granular salt, which could not be brushed off. The fine-grained salt served as a confusing inconsistency considering that the kitchen used coarse cracked pepper on the burgers. The Value: $3.00 for fries and a 10 buck burger that didn't warrant eating more than half of it. The value was...meh. Burger Review : Simmzy's prepared an OK/Average burger. If you asked them to go easy on the pepper, it would probably be a little better.